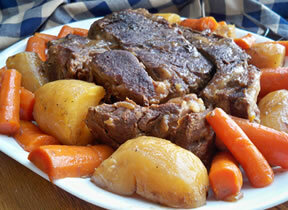 Savor the homemade taste of tender pot roast and vegetables. The roasting bag makes the clean up quick and easy. 1. Preheat oven to 350°F. Arrange opened Cooking Bag in 13x9-inch baking pan or dish. Place roast and vegetables into bag. 2. Stir Seasoning Mix and water until well blended. Pour over roast. Close bag loosely with nylon tie. Cut 4 small holes in top of bag to allow steam to escape. 3. Bake in lower half of oven 2 hours. Remove from oven. Let stand 5 minutes. Cut open bag. 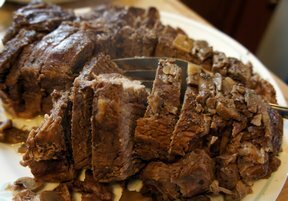 Serve roast and vegetables with pan juices. If desired, thicken juices for gravy or serve with prepared McCormick® Brown Gravy. 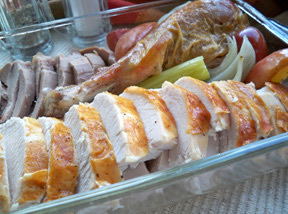 For Smaller Roasts: Bake smaller roasts (2 to 2 1/2 pounds) for 1 to 1 1/2 hours.